This creative group of highly skilled musicians and teachers specializes in workshops and stage performances. They weave together musical lessons with entertaining stories to engage participation. Each performer has been trained in the Mystic Drumz style of delivery and instruction. All Mystic Drummerz have developed their experience and knowledge hands-on in the field. Our team also includes experienced audio visual technicians, costume designers, and stage crews. The energy, enthusiasm, and experience of the team have created a high demand for their services. Team Member: Dave Gould started drumming when he was 12. He started on snare drum and broke all his mom’s wooden spoons before he discovered drumsticks. He is a professional percussionist who has recorded more than 30 albums. He has been seen making music on everything from BBQs to kayaks to trees in the woods. He graduated with honours from the MohawkCollege music program.Dave is a dynamic performer and storyteller who loves to work with children. Ask him about the time when he co-wrote a song cycle with 5 birds, 2 chipmunks and a cat. He also makes crazy instruments out of the strangest things like plumbing parts, rain barrels, toilets and recycled garbage. 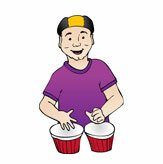 Dave loves to share his love for music in the Mystic Drumz adventures. Mike began his drumming journey deep in the forests of northern Ontario. It was here that he learned the language of the animals and was often observed wandering through the forest joking with squirrels, conversing with rabbits, and debating deer. His love for rhythm began at this early age too.Soon Mike was pounding out beats on his homemade drum kit, made from hollowed logs, rocks, stumps, and sticks. He would sit and play for hours entertaining the forest creatures and honing his skills. One day, after finishing an extra long drum solo, he meet a small grey pigeon who was passing through from the city. Peggy (as the Pigeon was named) told him of all that there was to do see, and learn, in the city, and told him of the great many other instruments and sounds that existed all around the world. This greatly excited Mike, and so, after mustering up all his courage, he set out on a great worldwide journey exploring strange new lands and discovering tons of cool instruments along the way. 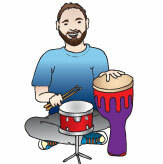 Mike currently lives in Toronto working as a session musician and private teacher. He studied music performance at both Humber College and at York University, and studied privately with the likes of Barry Elmes, Paul Delong, Rick Lazar, Barry Romberg, and Don Vickery among many others.